In March of this year me and my friends Vas and Ben headed to Scotland for a week’s road trip. Our friend Anand also accompanied us for the first couple of days. Somehow, despite living in the UK my whole life so far, I hadn’t visited Scotland yet so it was time rectify this. The rendezvous point was Ben’s as he lives in Nottingham, which is the furthest North out of any of us. The drive up was pretty fun as we broke it up with a few stops. The first was the Angel Of The North in Gateshead, followed by a pub lunch Newcastle and a walk along the Tyne, then a stop at Bamburgh Castle although we didn’t go in, we just walked around it, including on the beach. Last was Berwick Upon Tweed, which is an English border town that has frequently changed hands with Scotland throughout history. Arriving in Edinburgh we headed for our Hostel. We stayed at Castle Rock, and as the name suggests it is right by Edinburgh Castle. We headed out for some food and a couple of drinks before calling it a night. Saturday morning and time to explore. Me, Vas and Anand headed into Edinburgh Castle. Ben had been before so he went off to do his own thing. It is situated on a rock that overlooks the city. I can see why they picked the location for it, it is very commanding! It has great views over the old town in Edinburgh as well. 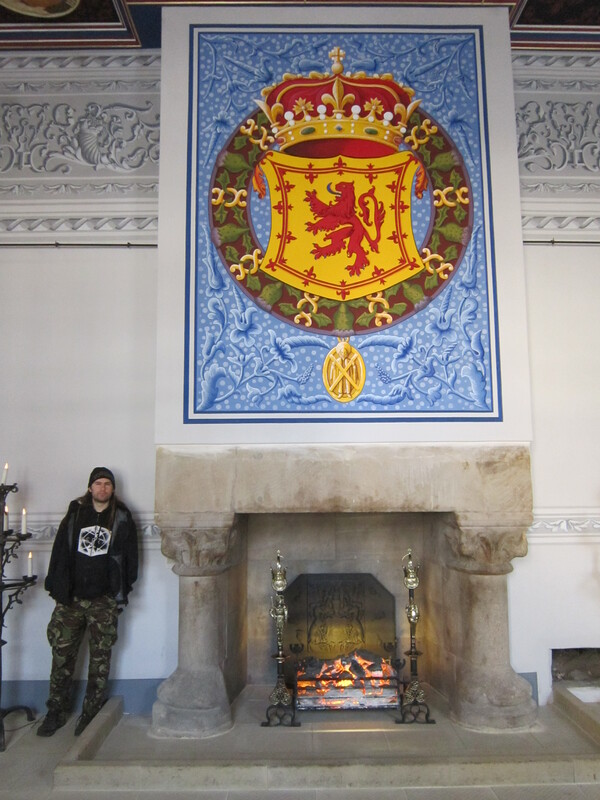 The Castle has some great history, involved in all kinds of battles and wars from the Medieval ages through to the Jacobite risings in the 1700’s. Among the exhibitions you can see the ‘Stone Of Scone’, which was used in the coronation of Scottish Monarchs in centuries past, and the Honours of Scotland which are their Crown Jewels. There is also a Dog Cemetery where soldiers buried their passed companions, which i thought was really nice. I read about the sieges whilst in the castle, particularly the Jacobite rebellion and how may of the Jacobite’s holed up inside died from illness after being forced to eat snow as their water supplies ran out, and later on that day when heading past the castle I stared up at it and imagined what would be like to siege it, crazy to think about. Following that we headed down the Royal Mile, that runs from the Castle all the way down the Parliament, Holyrood. It’s very lively, some pretty buildings and architecture. 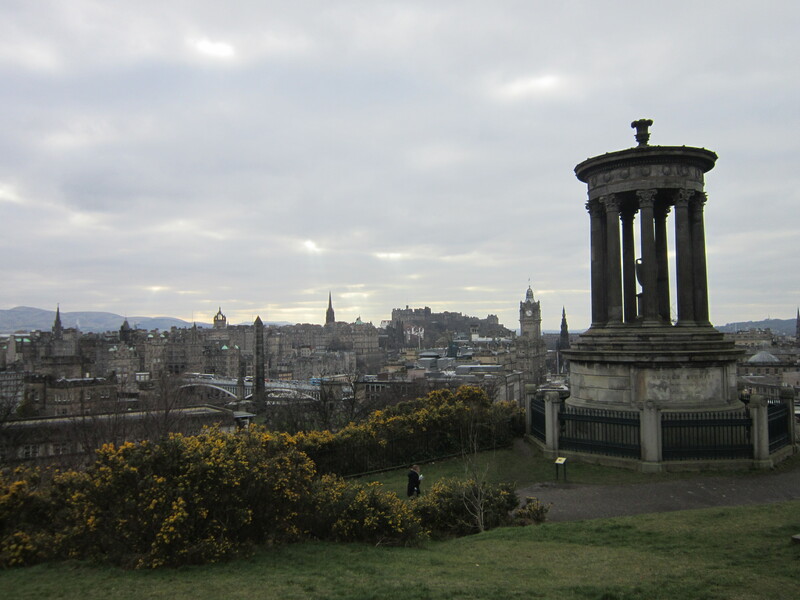 Then we headed up to Calton Hill where you can get great views over the city from the Bell Tower. The National Monument and some other buildings are also located there, all worth checking out. After a brief look at the Holyrood Parliament building we ventured around some of Holyrood Park which also has great views over what is a very picturesque city. We didn’t go all the way up Arthur’s Seat but it looked fun and if I go back then i’ll do that. In the evening we took it easy at the hostel and played card games with one of our room mates. Sunday and Anand said farewell as he headed off to explore more of the city and then home. Me, Vas and Parbs grabbed some supplies, jumped in the car and headed west for Loch Lomond with the intention of climbing Ben Lomond as far as we could with no equipment (over than boots, map and food etc). It’s the biggest Loch in Scotland and it really is a spectacular place! We parked up at the base of Ben Lomond and I gazed over the Loch for awhile, taking it all in. 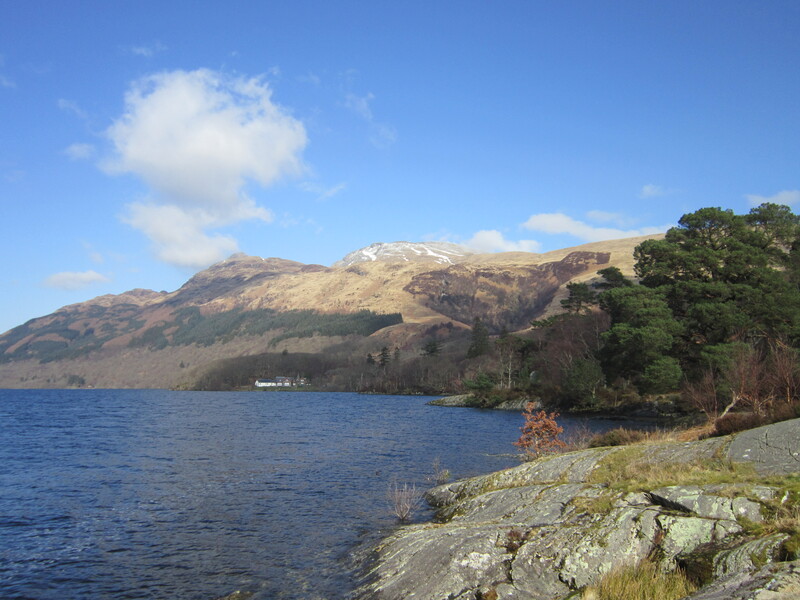 Ben Lomond itself is 974 metres (3,196 ft). Loch Lomond. The snow covered peak is Ben Lomond. The walk was quite steep to begin with and we’d set off a bit late so we kept a pretty quick pace. The views over the lake really were amazing and it was a nice sunny day for it, and the sun stayed out most of the climb. It was really quite as well, only saw a couple of other walkers. As you can see from the above picture there was a fair bit of snow at the top. Ultimately we didn’t make it all the way as the route near the summit turned into ice and rock and not much else. I guess we were between 50 and 100 meters from the top when we called it, there was virtually no visibility and we nearly got stuck, having to slide some of the way down which of course is pretty dangerous and not recommended! 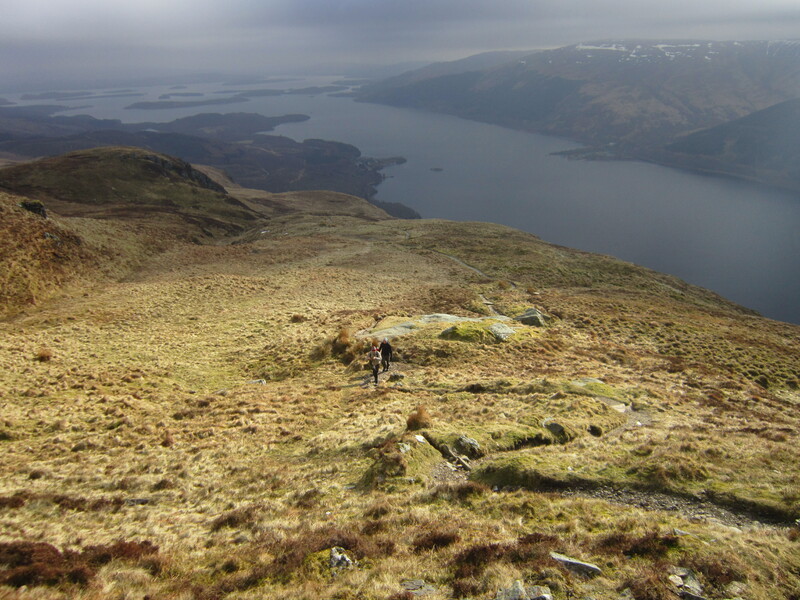 Looking back at Vas and Ben as we walk up Ben Lomond. On the walk down the greatest spot was a herd of Red Deer as evening set in. There must have been around 15 of them. By the time we had returned to the car it was dark and we were pretty tired out. We spent the night in Crianlarich. Next up was a trip through Glen Coe. We were driving a fair bit and made a few stops to see the scenery and have a little walk around. There were many beautiful sights and I would like to return some day and do a great deal of walking in the area. Not that we were skiing but we decided to get the ski lift up at the Glencoe Mountain site, so we could see the views on the way up and from the top and have a wander around. The surrounding area is known as Rannoch Moor and is very beautiful, feels a million miles away from somewhere like Edinburgh! Following that we went for a walk around the nearby forest, Glencoe Lochlan. It includes man-made lake, which the owner of the area created over a century ago for his homesick Canadian wife. 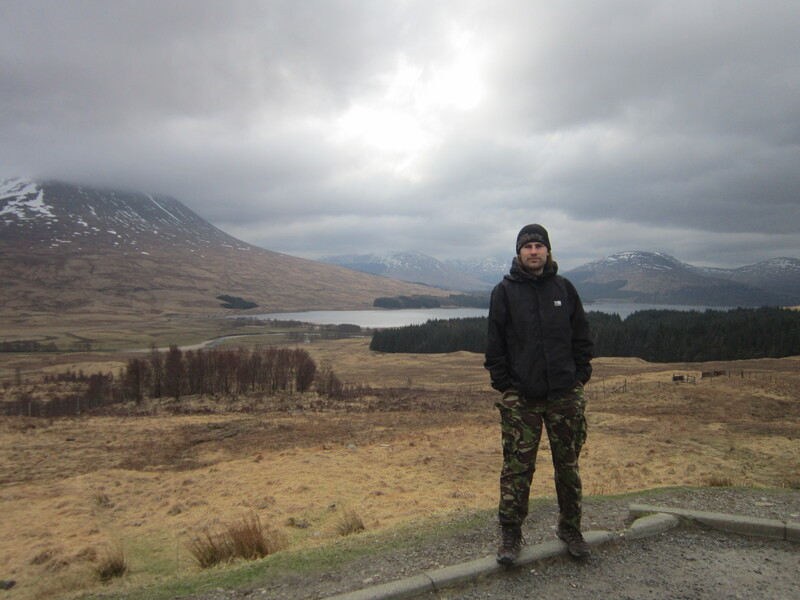 We spent the night in a hostel near by to Fort William, and the next day me and Vas went for a look at Ben Nevis (Ben had a cold so he spent the day in Fort William). We set off too late in the morning and we didn’t have time to climb the whole way, plus we were mindful we had no equipment in case of snow and ice (as with Ben Lomond! )m so we decided to see how much of the climb we could make in the time we had. I calculate it to be about 3/5th’s….and i am every determined to return one day and do the whole thing! It was a really nice sunny day so the views were amazing and we spent much time soaking it all in. The Red Burn marked the half way point. We also saw a young Stag just sitting off the side of the path as people walked on past. That dude was fearless. After picking Ben back up, we headed for the Isle Of Skye. We were staying in a lovely hostel in Broadford. Randomly whilst talking to of the other guests there (a German Girl) I discovered she knew and indeed had lived with someone I had met in Copenhagen last year. Small world, as they say! I have heard a lot of people eulogise Skye and it did not disappoint! I really love the place. We had one full day on the Island so we decided to do a road trip around it, see as much as we could. After a few minutes of setting off (heading to the North East of the island) we were driving along the coastal road and there were amazing reflections of the mountains in the Lochs along the way (note:. We got to Portree and went for an explore. It’s small town by anyone’s standards, though actually the largest of the island. The harbour is the main feature, with its sprinkling of boats here and there, and the town is situated on the cliffs above it. There is a row of painted houses down by the waterfront that add to the view. There was also some random watchtower which naturally I decided to find and climb to the top of off. Continuing along the road we came across a waterfall that we spent a time climbing all over and admiring. We passed by the Old Man Stoor, a rock formation which kind of sticks out into the surroundings. Then we stopped at this place where there used be an old Diatomite mine. The place had ties to German industry and some of its residents allegedly may have helped out German U-Boat sailors by supplying them with fresh water and supplies during wartime. Allegedly! There are a couple of reminder so of the places industrial history on the beach, old pipes and alike. The cliff above made a nice place to sit and eat lunch whilst staring out to sea. 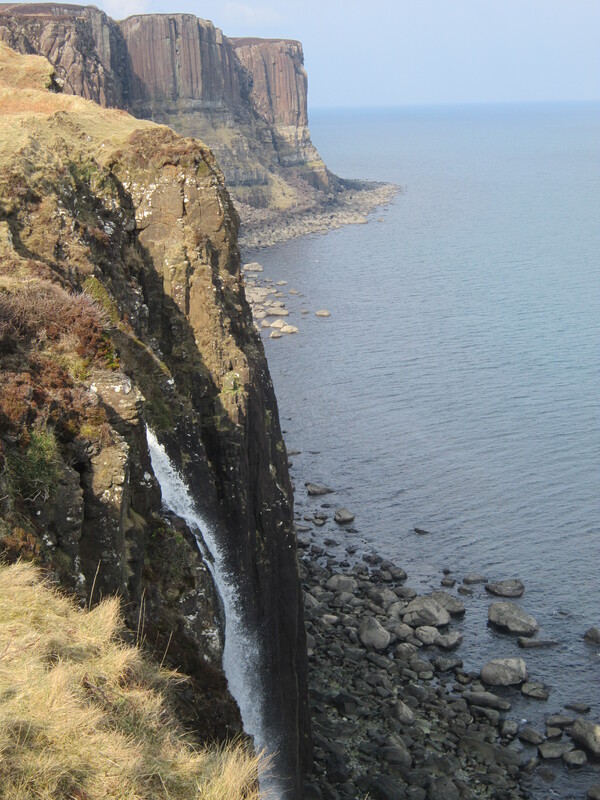 The Kilt Rock and Mealt Waterfall are a sight to behold. Word has it that the Vikings used Kilt rock for navigation, and I can see why, it certainly would make a useful landmark from sea. Not every day you see a waterfall flowing straight onto a beach either! Sticking with the Viking theme we headed to the most Northern point of the island, where at Duntulum there is beach with what looks like marks that are supposed to be from longships mooring. The area used to be under Norse control (as were much of the Western Isles at some point).. The main highlight is a ruined castle which is a few hundred years old. And I mean really ruined, the bits still standing look like they might collapse at any moment! We then drove across to the North west part of the island. We went past Dunvegan Castle though we didn’t get a chance to go inside it. We also randomly went to the village of Stein as we got a bit confused, but finally we made it to our target, the coral beach at Claigan. It’s about 1km off the road, and its very remote, we only saw a handful of other people (including the girl from the hostel In mentioned earlier). Oh and we saw a Seal bobbing it’s head up and down along the way! The beach looks kind of Caribbean like, and the internet tell me it’s not actually made of coral at all! The sun was beginning to set so we set off for Neist point, the most westerly point on Sky. There is a lighthouse located there but we were there for the view of the sunset over the sea, which was magnificent. I wish i’d more time to see the Isle Of Skye as I know there is so much i missed. Another for the long list of places to return to and explore more! On the way to Skye we had stopped to see Eilean Donan Castle at nighttime, when it was lit up. 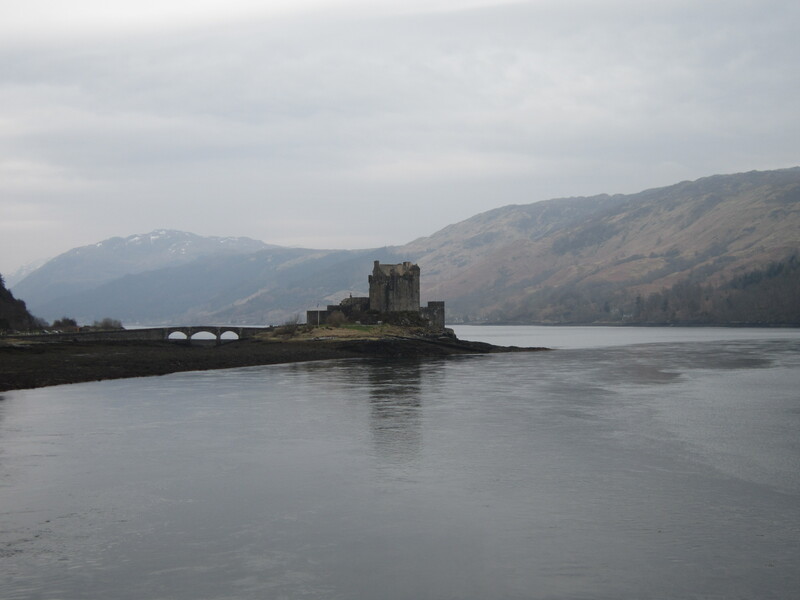 It is on a small island, located at the meeting point of 3 Lochs. Back on the mainland we headed there first to see it at day, and we went inside and did the tour around it. Pretty interesting, it was very hard to capture due to its location. It was destroyed in 1719 during one of the Jacobite rebellions and was rebuilt in the 20th Century. During that rebellion it was actually garrisoned by Spanish troops fighting on the side of the Jacobite’s in support of James Stuart. The tide was out so we didn’t really get the full effect of the water. Apparently it’s ‘probably’ one of the most photographed castle’s in the world. Most of the pictures are taken from the car park which is on the other side from my picture below, but I think (due to the tide being out) this one gets the island effect better than the one I took from there. Lunch was had at Fort Augustus which is on the southern tip of Loch Ness. It seemed to be a very busy (for it’s small size) travel hub for people exploring the area. Driving along the west side of Loch Ness we visited the ruins Urquhart Castle. It’s fun to explore and the ruins cover a fair area. We did not spot Nessie. We stayed the night in Inverness which i’m afraid I didn’t particularly like. Just felt like so many other boring cities in the UK, very uninspiring. Last major stop was Stirling. Completed in 1869, the Wallace Monument looks over the site of the 1297 Battle Of Stirling Bridge, where a Scottish force under William Wallace famously defeated an English army (which for info had many Welsh troops among it’s ranks). This National Monument tells his story and gives detail of the battle and other events in his life as you ascend it. From the top you can see all around for miles and miles, including mountains such as Ben Lomond which I talked about earlier in this post. The Battle was a momentous event in Scottish history so (even though I am English) I think it’s great they have marked it like this. Stirling Castle is one of the most historically important castles in the whole of the British isles, and it’s looks great too. Given it’s key strategic location In Scotland it has seen it’s fair share of battle and siege, and it was also used as a royal residence and several monarch’s were crowned there. For a rare change I went on the guided tour (it was free so no worries on that part) of the castle along with Ben and Vas, and it was worth it as we learned a lot of interesting things about its former residents and the castle itself. We also took the time to see the present day Stirling Bridge, the site of the battle of course. Then we took a walk up nearby Gowan hill, on which can be found the ‘Beheading Stone’ complete with axe marks. 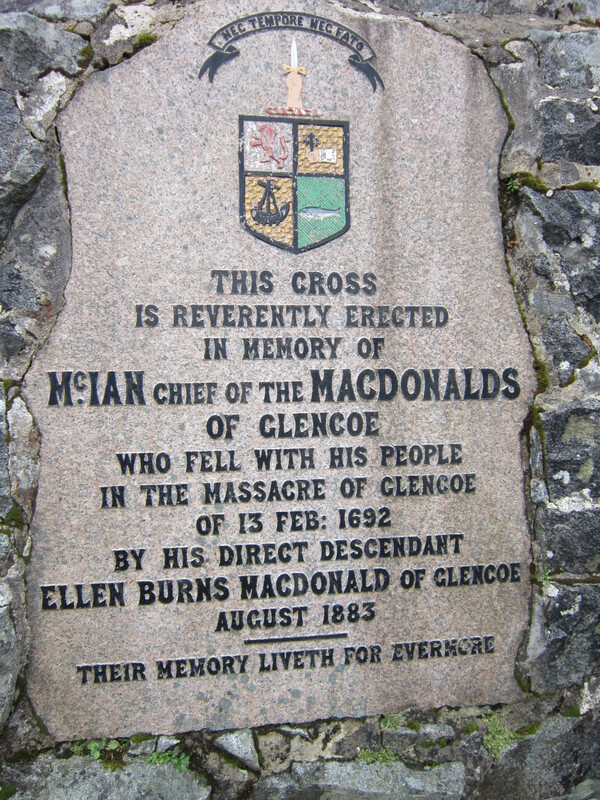 As you can probably guess it was used for executions. After spending the night in Stirling it was time to return to England. Great trip, since getting back i’ve read up on some Scottish history so now I understand what all the mentions of Jacobite’s were referring to (if you don’t know it have a look into it. It may well give you a different perspective on the current British monarchy) and it has definitely given me a better understanding of the Scottish independence movement. 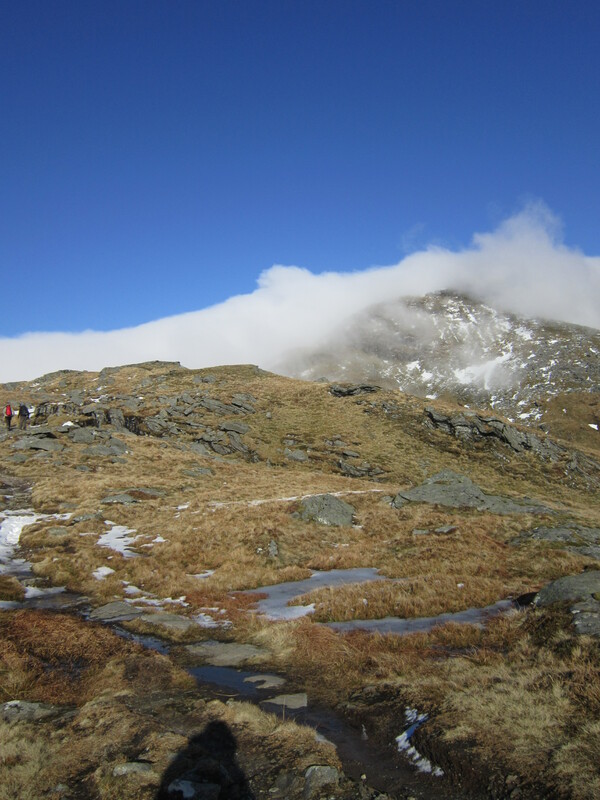 The Ben lomond hike looks quite interesting ! How long did it take you to get there ? I will definitively go back there to do this hike, and go back to Fort Williams for Ben Nevis ! Scotland is an awesome country and you’ve done an excellent job of showing and describing some lovely sites in this post. I’ve been further north than you went on the three times I’ve been up there. We usually head north of Inverness. I agree that the history is fascinating, particularly the Jacobite rebellions, and the scenery is stunning. I’m glad you had a great time up there. Thanks Millie! I really enjoyed it, definitely somewhere to go back to! The scenery is indeed stunning, I’ve always heard it was nice but some of the views just blew me away! I feel like that when we go up there. I live near Newark so we haven’t as far as you have to go, but Lowlands or Highlands it’s all gorgeous. I want to get up to the Shetlands and Orkneys sometime, too, as well as out to the more westerly islands of the Hebrides. Scotland has a way of getting her claws into you, alright. I really enjoyed your post, Dave.